Finance is critically important to addressing climate change. In 2009, developed countries pledged to mobilize jointly $100 billion a year in climate finance by 2020 for developing countries. With two years left to the deadline, it's natural to ask: How are they doing? Last week, the UN climate convention's expert finance body, the Standing Committee on Finance (SCF), released its third Biennial Assessment of Climate Finance, which gives the state of finance flows up to 2016, the latest year for which countries are required to report to the U.N. It is one of the most authoritative analyses of climate finance. Similar to the Intergovernmental Panel on Climate Change, the Biennial Assessment is written by a team of technical experts, then extensively reviewed and approved by the 20 government representatives on the Standing Committee (10 each from developing and developed countries). The report has useful findings for negotiators at COP 24 who, among many other areas of the Paris Agreement's implementation guidelines, will be working to agree improved rules for how countries report on climate finance. Looking at overall public and private climate finance flows in all countries, there was positive news. The high-bound estimate of global climate finance was $681 billion in 2016, an increase of 17 percent over the 2014 level. Renewable energy investment did drop by 16 percent in 2016 (in part due to falling technology costs, which makes it possible to do more for less) but was partly offset by an 8 percent increase in energy efficiency investments and a 35 percent increase in sustainable transport investments. The $100 billion commitment is focused on efforts by developed countries to mobilize funding for developing countries, and is a key part of the grand bargain that underpins the Paris Agreement. The Assessment has good news here too: public climate finance from developed to developing countries reached $55.7 billion in 2016, a 30 percent increase over 2014 levels. About 60 percent of this money flowed went through bilateral and regional channels, 35 percent through the multilateral development banks (or MDBs, pro-rated to account only for the share that developed countries contribute to these institutions), and four percent through multilateral climate funds such as the Green Climate Fund. Around half of finance funding flows through bilateral and multilateral climate funds was delivered as grants, while three-quarters of MDB funding finance was loans. However, it isn't just developed countries financing climate action. Emerging economies are growing players in the climate finance landscape as well. 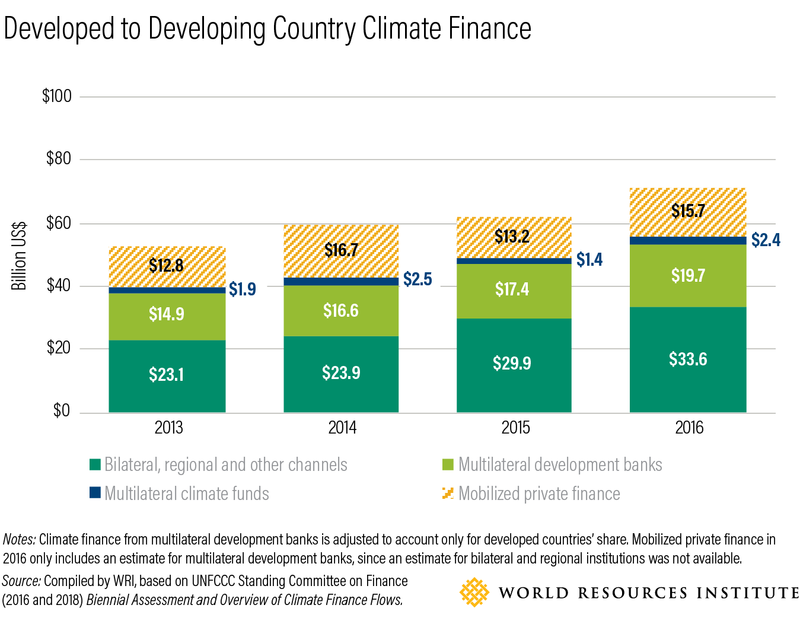 The Assessment estimates that climate finance flows between developing countries were $11.3-$13.7 billion in 2016, an increase of around a third from 2013-14 levels. 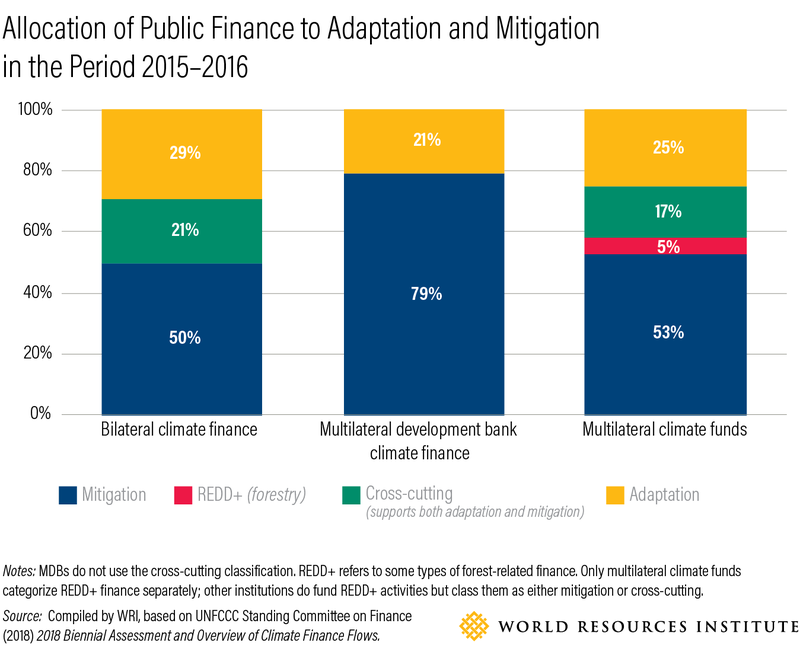 The Assessment also includes a chapter looking at how broader finance flows, that aren't primarily driven by climate considerations, are being aligned with climate objectives. "Making finance flows consistent with low greenhouse gas emissions and climate-resilient development" (Article 2.1c) is one of the three long-term goals of the Paris Agreement that the Global Stocktake will assess progress towards every five years starting in 2023. It is good to see that the SCF starting to think about how to measure this alignment. While the majority of funding counted towards the $100 billion goal is from public sources, mobilized private finance will play an important role in reaching the target. The Biennial Assessment reviewed a variety of estimates of private climate finance mobilized through public support. The Organization for Economic Cooperation and Development (OECD) estimates that private finance mobilized by bilateral and regional finance was $2.3 billion in 2015 (they did not produce an estimate for 2016) while MDBs, reported mobilization of $10.9 billion in 2015 and $15.7 billion in 2016. Approaches to tracking vary widely, and there is room for improvement. Negotiators have an opportunity to enhance the way private finance mobilization is reported as part of the Paris Agreement’s implementation guidelines. The Paris Agreement includes an aim to balance funding allocation between mitigation and adaptation. However, at around a quarter of total public funding from developed to developing countries, support for adapting to the impacts of climate still lags far behind that of funding for mitigation. The Assessment notes that adaptation finance is tracked differently between by different institutions. It also differs from mitigation finance because adaptation efforts are often more closely intertwined with development activities, making it harder to define and account for separately. Even so, given the scale and gravity of climate impacts we're already seeing, there is an urgent need to scale up funding for adaptation. The Biennial Assessment shows that total climate finance provided and mobilized by developed countries for developing countries reached over $70 billion in 2016. At just over half way to go to 2020, this suggests that developed countries were on track to reach the $100 billion goal. However, given recent negative rhetoric about climate finance from some developed countries there are concerns about what has happened in the years since then. Was 2016 a high-water mark for climate finance? We don't know yet, because countries aren't yet required to make public their 2017 climate funding data. Reducing the current two-year time lag in reporting is something the Paris implementation guidelines could fix. But a few data points give us reasons to be hopeful. Earlier this year, MDBs reported that their climate finance grew by 28 percent between 2016 and 2017, a significant increase. European Union countries and institutions also reported that their aggregate climate finance remained steady between 2016 and 2017. Even in the United States, Congress has continued to fund key international climate programs despite the Trump administration's efforts to cut this funding. But this is no time for complacency, and countries need to continue efforts to scale and improve the effectiveness of their climate funding. On December 10th, during the COP 24 climate negotiations in Katowice, there will be a High-Level Ministerial Dialogue on Climate Finance. This summit will provide an opportunity for countries to take stock of progress and announce new funding pledges that can build trust and enable further ambition.